This year has two themes for me, food-wise: peanut sauce and chimichurri. They’re both so addicting and versatile! I shared a bowl with peanut sauce last week, so I guess this week we’ll get to chimichurri! This salad is pretty straightforward — veggies, crunch, sweet fruit, and STEAK! 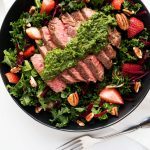 Chimichurri serves as a great topping for steak, and doubles as the salad dressing on this salad. How can you go wrong? You can’t. 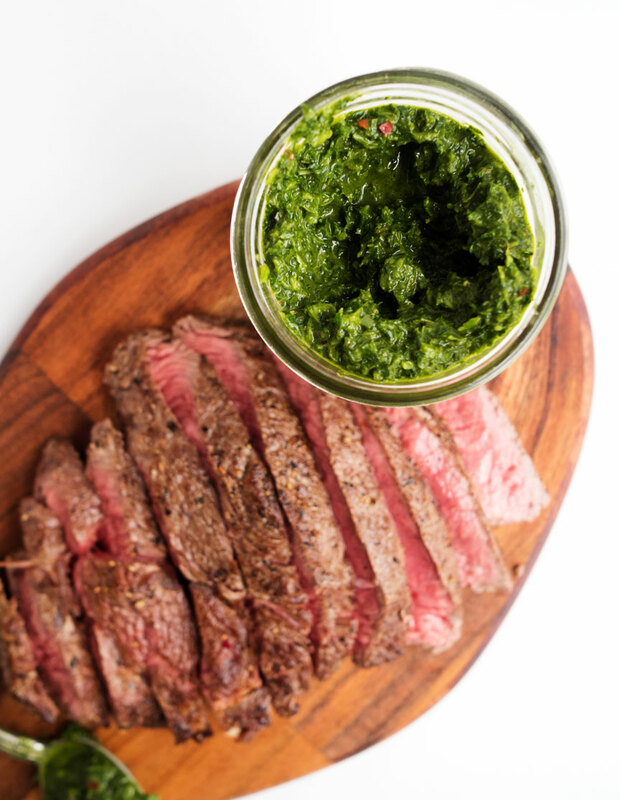 Begin by making the chimichurri. Combine all ingredients, except for salt and pepper, together in a food processor or blender. Pulse until nearly smooth, but not a paste. Add salt and pepper to taste, and more oil if necessary to reach your desired consistency. Set aside. 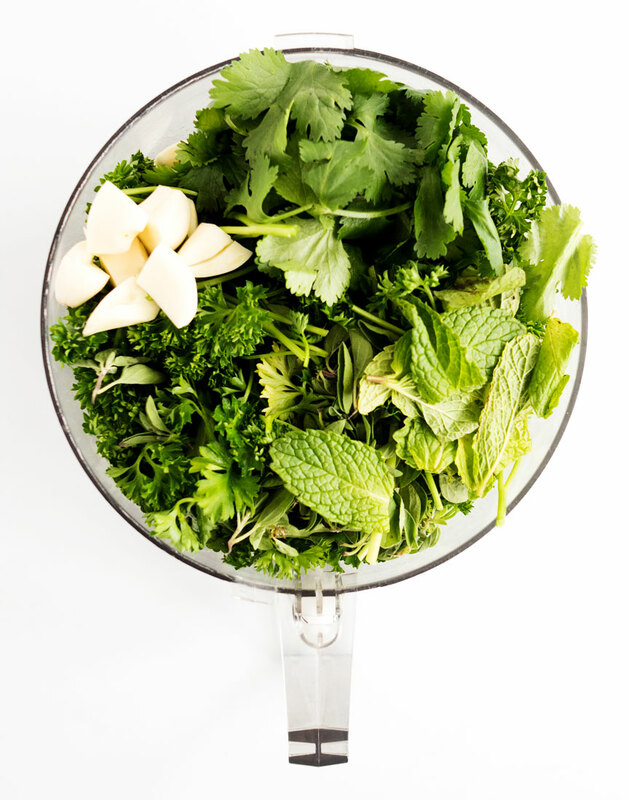 Place the kale in a large bowl and drizzle with 1 tsp olive oil. Using your hands, massage the kale until it has noticeably softened — 2-3 minutes. 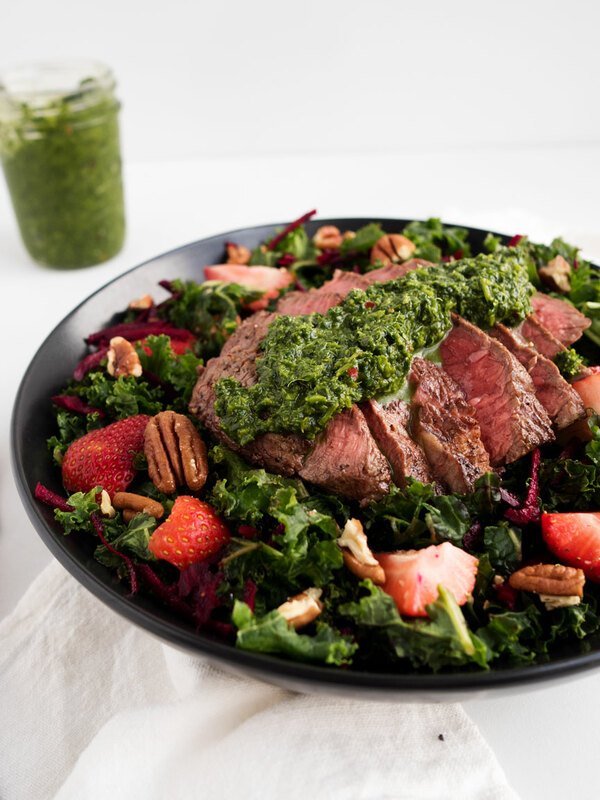 Once the kale has softened, mix in the shredded beets, quartered strawberries, and toasted pecans. Set aside. Season both sides of your steak liberally with salt and pepper. If you’re grilling, cook to medium-rare. If you’re cooking inside, preheat the oven to 450F and heat a skillet to high heat. Sear the steak for 2 minutes on each side before putting in the oven for 5 minutes (this could change depending on how thick the steak is). Use a thermometer to determine when it hits 140F, then remove from the oven. Transfer the steak to a plate and cover with foil for 10 minutes before slicing it into strips. 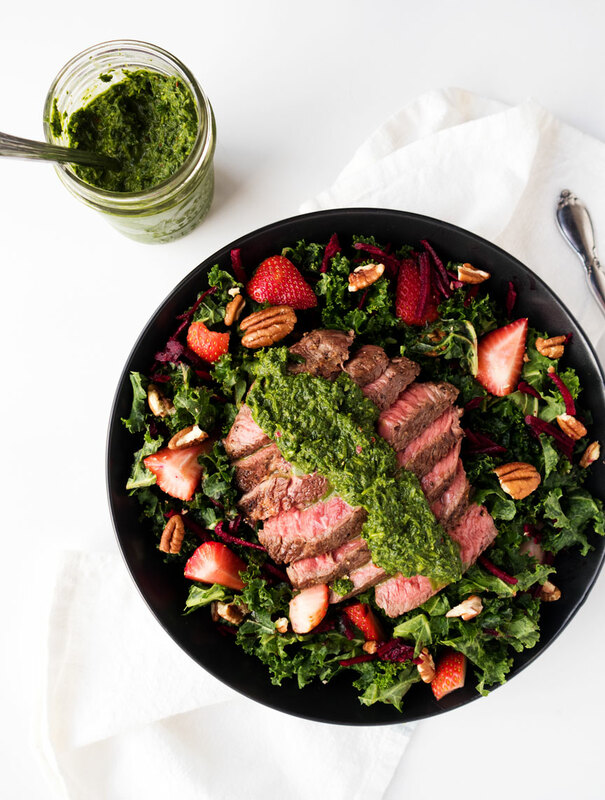 Serve the salad topped with sliced steak and generous dollops of chimichurri!